Having left cinema audiences in 1974 reeling with The Texas Chainsaw Massacre the late Tobe Hooper was looking for his next film. He was sent the script for Eaten Alive co written by Mardi Rustam who would also produce the film and who Hooper would later have spectacular clashes with on set. Featuring Neville Brand as Judd a swivel eyed redneck who runs a ropey hotel in Texas and like all good hotels kept a huge crocodile in a swamp that he would feed anyone who upset him……it was a business model that Donald Trump would decline as being too liberal. Incredibly the script was loosely based on the true story of Joe Ball who owned a bar that featured an alligator pit as an attraction where the murders of several women occurred. Unusually Eaten Alive would have many exterior scenes that would actually all be shot inside a studio including the crocodile swamp which would be shot in a tank that had been used for the opening scenes of Billy Wilder’s ‘Sunset Boulevard’. 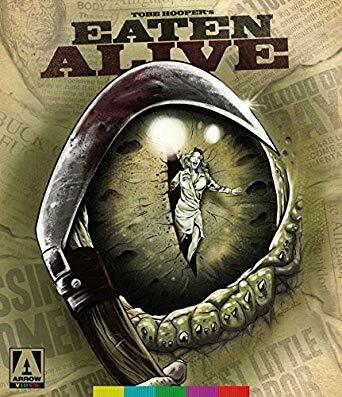 Eaten Alive had an interesting cast that featured Mel Ferrer (who had been married to Audrey Hepburn), Carolyn Jones (who had made a name as Morticia Adams in the iconic TV series The Addams Family), Marilyn Burns (who had been in Texas Chainsaw) and a young Robert Englund who would hit pay dirt 8 years later when he was cast as Freddy Krueger. 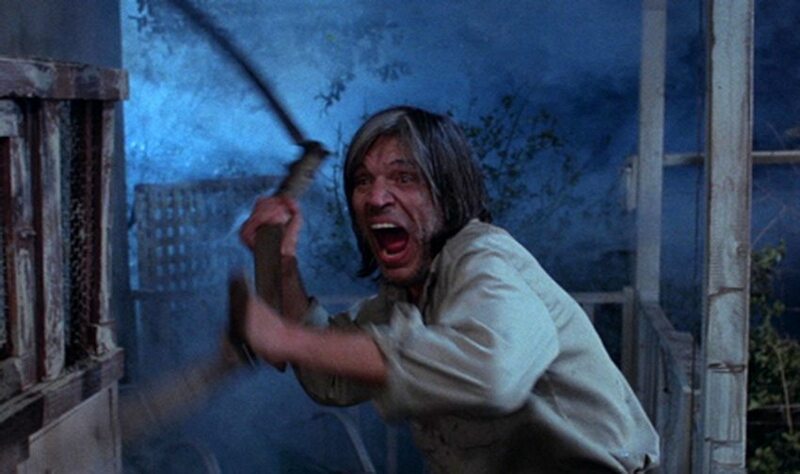 The shoot was beset with animosity between Hooper and producer Rustram who frequently interfered with how he wanted Hooper to shoot the film and in the end after a massive bust up Hooper walked off set leaving Rustam to direct Janus Blythe who had only accepted the role because she had wanted to work with the Texas Chainsaw director. Despite this Eaten Alive is an enjoyably pulpy B movie with Neville Brand running around with an enormous scythe despatching guests with aplomb and a giant crocodile that’s better than you might expect for a low budget horror. 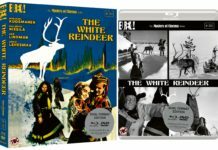 Released on DVD & Blu Ray there are some decent extras here with a so-so commentary by Rustam a few of the lesser known actors and a make up artist. A 2015 interview with Tobe Hooper, plus several featurettes with the main actors notably Marilyn Burns and Robert Englund as well as a feature on the Joe Ball story which is interesting if a little slow. Running at a brief 91 minutes Eaten Alive would be what musician’s call ‘the difficult second album’, and Hooper’s problems on set would continue with his next film ‘The Dark’ before he really hit his stride again with 1979’s adaptation of Stephen King’s ‘Salem’s Lot’. But Eaten Alive is enjoyably daft with enough gore to please B-movie fans. 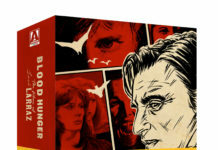 EATEN ALIVE IS OUT NOW ON DVD & BLU RAY. Previous articleWill we ever see a Woody Allen film again?